Mainly sunny to start, then a few afternoon clouds. High 67F. Winds NNE at 5 to 10 mph..
We are looking for people who enjoy helping others to successfully answer inbound telephone calls from customers inquiring about goods and services from clients of Five Star Call Centers, while providing high-quality service with a helpful, professional attitude. We are locally owned and have been in the call center business for over 30 years. Our offices are located smack-dab in the Midwest, with strategic locations in North Dakota, South Dakota, and Kansas. We do inbound, outbound, email, and chat for Customer Service and Technical Support. Five Star Call Centers is the region’s premiere outsourced customer contact company. Serving markets from coast to coast, Five Star Call Centers delivers sound solutions based on targeted strategy and insightful execution. Our mission is simple: To deliver total customer satisfaction in a passionate, relentless, and impactful manner. Specifically, within the call center, Five Star Call Centers enjoys company-wide growth, yearafter-year. 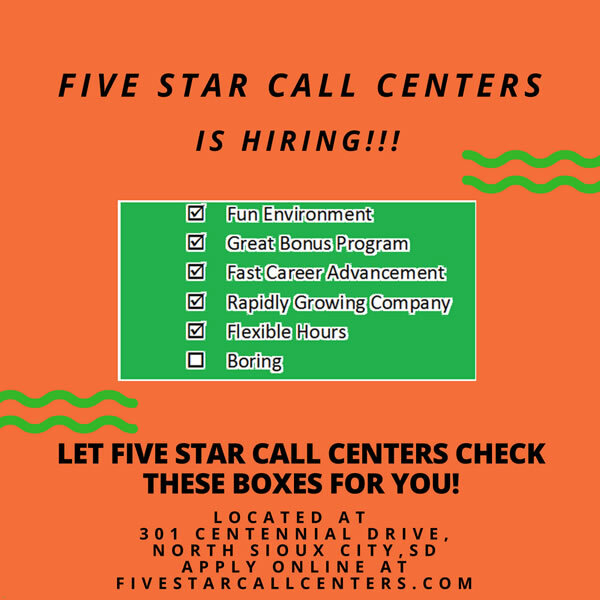 Five Star Call Centers employs more than 450 full-time and part-time employees and is privately held by its founders and the new generation of Officers. If you enjoy helping people, have average or better computer skills, and are interested in joining a rapidly growing company, please complete our online application. Possess the ability to demonstrate a comprehensive understanding of the specific client products and services to identify and satisfy customer needs. Possess advanced customer service skills including knowledge of client policies and procedures to maintain a high first-call resolution rate. Be able to successfully handle customer interactions in multiple systems. Adhere to Five Star Call Centers privacy policies and procedures to ensure each customer's privacy is protected. Record electronic customer transactions accurately and with every contact. Being able to speak Spanish is a plus. Five Star Call Centers will make reasonable accommodations in compliance with the Americans with Disabilities Act. Five Star Call Centers is an Equal Opportunity Employer and participates in the E-verify program.